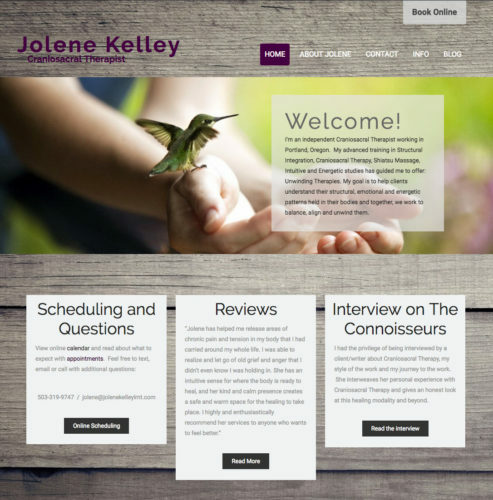 Jolene Kelley is a Craniosacral Therapist in Portland, OR. She hadn’t updated her site in several years. Her previous site was not responsive and while it did a good job of delivering information, it needed a refresh. Jolene was also frustrated that she was unable to update the site other than adding and editing posts and pages. In order to save time and money, I found a template (Colorist by <span class=”author”><a href=”https://wordpress.org/themes/author/webulous/”>Venkat Raj</a>) </span>with a great customizer and used that as my starting point. There’s a funny story about how I met Jolene. I’ve been job hunting for several months off and on. It’s been stressful to say the least. I needed to give myself a day off so I headed to the soaking pools at <a href=”https://www.mcmenamins.com/kennedy-school”>McMenamin’s Kennedy School</a> for a soak. Jolene was there with her 4 year old daughter. Her daughter to a liking to me, it happens a lot to me, whether Juniper’s with me or not, kids tend to like me. Jolene and I started chatting about life and work. She asked me if I was looking for small website work and I said yes! Her beautiful site is the result. She had a big hand in the design, I just made the code magic happen. She threw in a Craniosacral appointment as a thank you and, let me tell you, this woman has a real gift. I’m so proud of how great the site turned out and I’m extra lucky that I met a great person.